With over 9 million people in the capital of Thailand, we are on the move and we all have to eat! 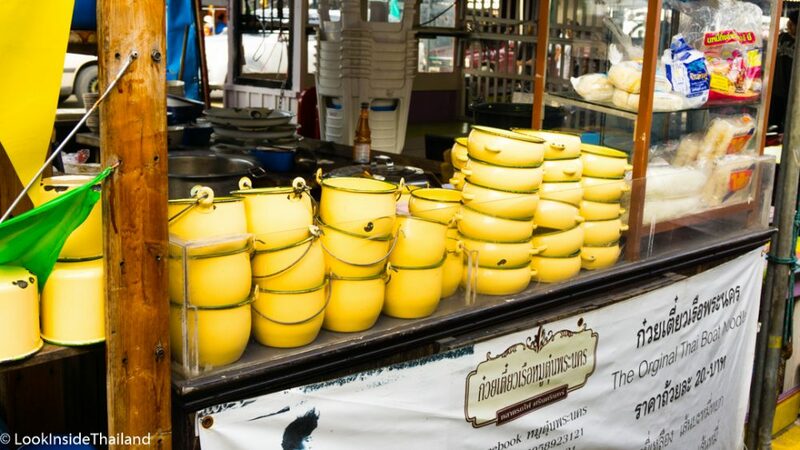 This is my top 5 choices for street food in Bangkok. Make sure you try these! We Thais will normally eat at vendors with tables on side streets and alleys. Some of the best food can be found hidden around a corner! When you are in Bangkok, part of your adventure should always be to find authentic Thai food and I’ve made a list of my top picks! Anytime you are hungry, you can find satay! A snack, a meal….a…dessert? Maybe all! Satay is skewered and sliced meat that is marinated with Thai spices and fire grilled, and then served hot with a soy and peanut sauce for dipping. So delicious! You can find satay gai (chicken), satay moo (pork), satay neua (beef) and even satay pla (fish). Pork is what I prefer, tender, juicy and a little spicy covered in the delicious satay sauce. Learn more about satay in our Street Foods: Satay blog post! 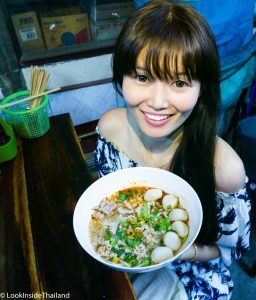 Thai people absolutely love noodle soup and it is definitely one of the national foods of Thailand. In Bangkok, it’s hard to walk 3 blocks without finding a street vendor who sells kuay tiew. With many different ways to order and made quick and fresh every time, Kuay tiew is a great street food any time of day. Inexpensive, quick to make, and really delicious, kuay tiew can be ordered however you want. Learn more about how to order delicious kuay tiew in our Street Foods: Kuay tiew blog post! 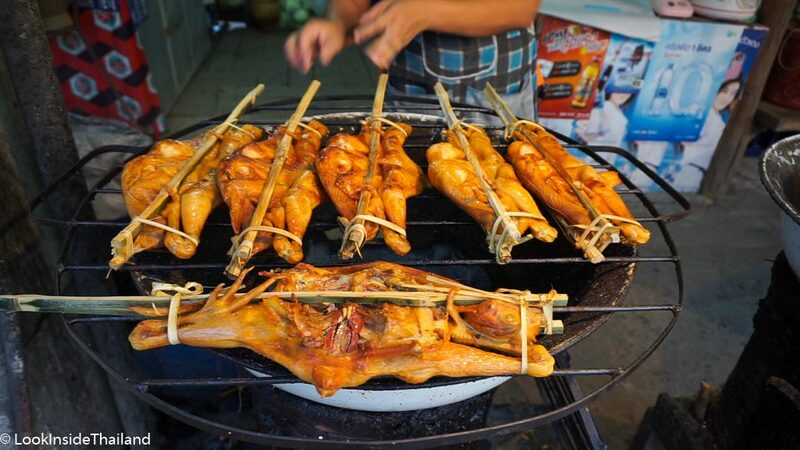 The traditional Thai-style barbecue chicken from Isaan, gai yang is one of the most popular foods in Thailand. Made by cutting a chicken breast in half, squeezing it flat between bamboo sticks, and grilling it over a low heat for many hours, the chicken is tender, juicy and so flavorful! Eaten with a spicy and sweet red sauce, gai yang has the amazing flavor of the marinade rubbed on it before it’s cooked. This delicious chicken is great by itself, but you should eat it with sticky rice for a real Isaan traditional dish! When walking down the street if you see big pieces of chicken on a grill stuck between bamboo sticks, you’ve found gai yang! Learn more about gai yang in our Street Foods: Gai Yang blog post! Flat noodles cooked with your choice of meat and soybean paste. 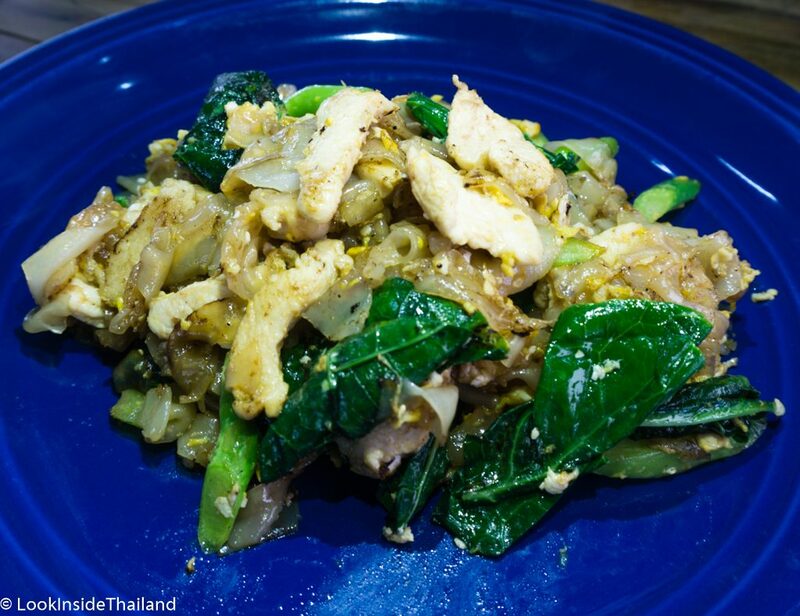 Pad see ew is a delicious and healthy dish with everything your body needs. Full of flavor, without any spiciness at all, this dish is cooked to order and served hot and fresh every time. The noodles are fried with a scrambled egg and garlic, pad see ew is one of the most popular dishes in all of Thailand. Learn more about pad see ew in our Street Foods: Pad See Ew blog post! My favorite dish of all time! Spicy, sour, sweet and healthy, som tam is a signature dish from the Isaan region in Northeast Thailand. Best known for its grilled meats and spicy fruit salads, Isaan is the part of Thailand where my family is from. Sure to make your mouth water and your taste buds dance, som tam is a tasty treat that is perfect for breakfast, lunch, or dinner. Made by mashing green papaya together with fish sauce, tomatoes, peanuts, sun dried shrimp, carrots, tamarind pulp, and Thai chili. It just doesn’t get much tastier than this. Served in a puddle of its own juices, no Thai dish is better for eating with sticky rice! Just squish some sticky rice into a ball between your fingers and dip it in the som tam juice. This spicy little ball will fill your mouth with all the wonderful flavors som tam has to offer. 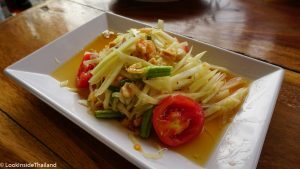 Learn more about som tam with our Street Foods: Som Tam blog post! Want to make som tam in your home? Try our delicious som tam recipe! There’s so many unique dishes in Thailand. I could have added 10 more! But these are some of my favorite. I hope you enjoy them!